What would my life be without two healthy, strong, functioning legs? I imagine much more difficult, despite handicap access on sidewalks, busses and buildings. I have compassion for those who must use a crutch, wheelchair or need help for mobility. So many journeys we take where there is no easy access or pavement. Thank you legs for carrying me everyday; my joy and my burdens. It’s so wonderful when we move slowly, coordinating with the breath, on morning walking meditations. Legs helping body, heart and mind slow down, relax and feel peaceful. Sometimes I soak you in the hot bath after slow, careful stretches. Other times I work you like beasts of burden to the point of exhaustion. Fortunately you have both bounced back from minor injury and not worn down or needed parts replaced. 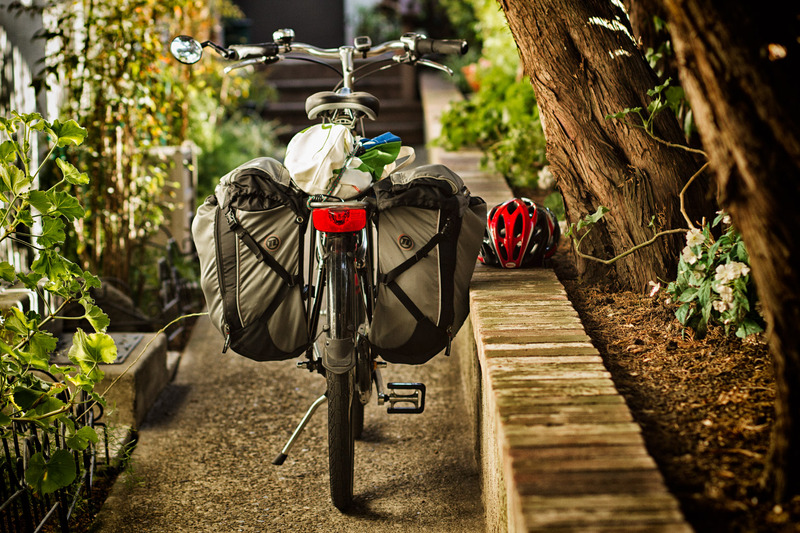 When we go shopping with the bike you happily pedal with load light to the market, and with load heavy, returning home, bike bags packed with tasty food energy. How nice not to drive the car for simple shopping, chores and local commutes that are only a couple miles away. Yesterday riding up and down hills, across town to meet a group to watch birds early in the morning, at times you both seemed drained while cycling the inclines. I understand, as the night before we did Zumba for an hour and got a sweaty workout. Actually we mostly jumped about, arms flailing and heart pounding, watching the young, athletic woman lead the class beautifully, like a professional Brazilian dancer. With gratitude they continued pedaling slowly to the park, with a short rest, getting up the hills eventually to witness many happy birdies. The true birders I met up with identified several species, including a rare, for the west coast, yellow-bellied sapsucker, sucking sap. Also a pair of gray herons showing off at tree’s top, in preparation for nest making (images below). There are so many conditions of happiness here and now. My legs are just two of them. Scanning the body identifies many others. Being free of thoughts or feelings that cause me to feel imprisoned, such as feeling fear, anger and despair, are significant conditions of happiness, also. So what conditions of happiness call out, at this moment, for your recognition? Sometimes it only takes a few mindful breathes in awareness to awaken to our own happy conditions. After a brief rest and some coffee, my legs will take me out for a gentle cycle to visit friends. This entry was posted in "bike commute", "Thich Nhat Hanh", Bicycling, Life, meditation, photography and tagged exercise, fitness, walking on January 19, 2013 by smilecalm. Love the pictures of the birds. I thank God every day that I have all of the body parts that allow me to walk, talk, see and smell. Thanks for visiting and the like of my post “Dissolving Cloud Trails”. Thanks for your kind words. It is wonderful to have working parts, especially as time goes on! May you be well, and happy shooting. It was a shame that all those poles only offered PR and begged for love instead of giving it. What the PR said they would do. Only take love, need love, never giving it. That is changing, and will happen now. Thank you for your kind wisdom! Your story has brought back for me so many wonderful memories of riding my bike due to a neurological disorder which compromises my coordination by bicycling days are curtailed but not over I am looking forward to the Spring. Such peace can be found in cycling. Cycling is enjoyable on some days. Others I enjoy moving slower and walk. See the cracks on the sidewalk better. I imagine you enjoying your happy conditions of getting about. May you be well. Thank you for the encouraging words. I stay busy and try not to dwell on my problems but focus my energy in helping others. There are many people who have it a lot tougher. Wishing you a peaceful and happy week! This is Geri, one of the bloggers in roomsofourown. Thank you for liking my post, “Walking Around the Rim of the Bryce Canyon Amphitheater.” I loved your gentle words above. I “don’t” take enough time to stop and just be thankful for what I have. I have just discovered hiking, and have a few physical shortcomings that I am learning to overcome. Last night I walked down from a local mountain in San Diego in the moonlight and slipped into a bush and got splinters in my hands. A rock fell on my hip and today I am limping and bruised. But because of your post, I am reminded that I “could” get up that mountain and see the sun dipping into the Pacific waters and the sky on fire afterwards, could see the moon shadows of the rocks and plants coming down. I am about to open my front door and take another little hike, guess it is called a walk . . . out my door and walk to church in the sunshine on this beautiful January morning and praise the Creator. Thank you again for your inspiring words. Thanks for your kind words. Some find using hiking poles helpful when going up and down slippery slopes. Wonderful to have such a beautiful environment to be with nature. May you be quickly heal, and be well. Thanks for your kindness. May you be happy. I really love the picture at the top of the post, it’s excellent. And really well written post to boot. It’s not a bad idea to take some lessons from Thich Nhat Hanh. Thanks for your kind words. May you enjoy the wind at your back and fresh breaths. I hope to get back to cycling in spring to the the feeling you just described; it just makes you feel so alive. Thanks for your kind comment. Wishing you joyous feelings in your travel, whether by foot, hooves or pedal. What a wonderful tribute to legs… something so precious and yet something we all take absolutely for granted. I thoroughly enjoyed this post! Thank you for your kind comment. My legs were happy with the recognition. Now I’ll body scan my way up, slowly. Thanks for visiting. I really enjoy the bike myself. It’s my primary form of exercise now. I nominated you today for Inspiring Blog! That is quite kind of you owlmcloud! I feel honored and wish good fortune on whoever wins. May you be well. I enjoy the beautiful images and words on your blog! Thank you for your kind comment. I look forward to learning about your gentle steps. May you be well. a wonderful place to visit. wishing you continued success and happiness. Beautiful and insightful. As a retired medical engineer who specialized in pediatric neuro-muscular conditions as well as being post polio myself I truly appreciate your insights. I appreciate such kind words from one with such experience and wisdom. May you be well and happy. Amazing pictures paired with beautiful prose. Thank you for stopping by and introducing yourself. This is a beautiful blog. I really do look forward to exploring writings both past and not yet imagined. Be well. I love aimless if only because I find it hard to do. I am enjoying exploring your blog. Wow! I never thought my blog post would attract such profound writers! Your words are so inspiring, a true reminder that Now is all that exists, or ever will. Thanks for stopping by! i smile to your kindness! also connects us to past and future. Thank you so much for stopping by my blog to like my latest post, Being an Instrument of Peace. It’s a shame that, as youngsters we run aimlessly about, not seeing all that is before us, loosing those moments to our hurried life. Only when we get older do we realize there is so much to see and enjoy. Legs… giving us the ability to move about; the loss of which gives those with a thirst for life those life experiences the rest of us cannot fathom. Parts all, or parts missing… there is so much for all to enjoy. thank you for your kind reminder! Life is a journey. Better to stop and smell the flowers. Thanks for visiting my blog! 🙂 well I look forward to your ideas as the immediate feel of ur blog interests me. Just got to sit down for a moment. The programmed to majority rules in communism will be diverse and beautiful again. I see that in you and many others. Its great being a people. and of life to discover! Your posts are lovely and I feel so good that you liked my blogpost. You are an inspiration ! Ah, what could be better than love, gratitude, and pizza? Wonderful post. Beautiful post! As someone with Parkinson’s, I never know from day to day which leg will prevent me from mobility. But I have learned that just because you have to go slower doesn’t mean you can’t see as much. In fact, you can see more because you’ve slowed down and are given a view of things that few think about seeing. But I still find my legs want to go faster Such is life, an endless paradox. And remember, going inward requires no movement at all… jcl. thank you for sharing your kind words and actions of courage and humility, JC!